An <iframe> tag used to embed another page or document into the current HTML page. We can use multiple Inline Frame in a single HTML page. Each Inline Frame has its own session history and active documents. <iframe> tag belongs to Flow content, phrasing content, embedded content, interactive content and palpable content. <iframe> tag supports Global Attributes and Event Attributes. 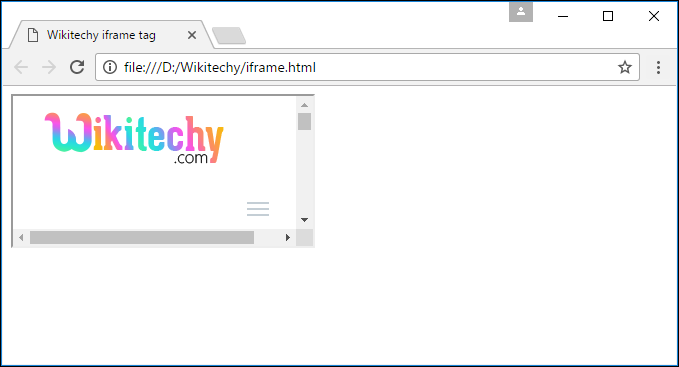 <iframe> tag used to embed “http://www.wikitechy.com/” in the current HTML Page. The output shows the ”http://www.wikitechy.com/” in the inline frame. bottom Yes No Specifies the alignment of an <iframe> according to surrounding elements. 0 Yes No Specifies whether or not to display a border around an <iframe>. height pixels Yes Yes Specifies the height of an <iframe>. longdesc URL Yes No Specifies a page that contains a long description of the content of an <iframe>. marginheight pixels Yes No Specifies the top and bottom margins of the content of an <iframe>. marginwidth pixels Yes No Specifies the left and right margins of the content of an <iframe>.